Many consumers appreciated the design of the Brooks Pureflow 7. A lot of people felt that this running shoe was lightweight. ‘Comfortable’ was a word that many used to describe this product. The versatility of this product was well-liked. People stated that using it for running, walking and standing for long periods didn’t become uncomfortable. Some people remarked that the redesigned tongue unit no longer rubbed against the skin, unlike the previous version. The underfoot cushioning system was lauded for being soft and responsive. Most of those who have bought this road companion noted that the general quality of the materials was robust. The upper unit was soft and flexible, according to a handful of users. Several consumers who had wide feet lamented the snug toe box of the Pureflow 7. Rocks tended to go inside the foot-chamber through the collar, according to a tester. The material on the ankle collar rubbed uncomfortably against the skin, some runners complained. A few people noted that the foot-chamber had too much room in it. They felt some in-shoe wobbling. Based on a couple of reviews, a break-in period of several uses was necessary to get an optimized in-shoe experience. Some consumers claimed that the midsole was too stiff for natural movement. More than a few persons grumbled of a fatigued midfoot upon wearing this shoe for more than thirty minutes. The feedback for the Brooks Pureflow 7 was relatively positive. A lot of consumers felt that this neutral road shoe was suitably lightweight, comfortable and versatile. They also welcomed its reactive midsole compound. But some people didn’t like the in-shoe experience, emphasizing an inconsistent fit. Others complained of the upper materials rubbing against the skin. The PureFlow model is one of the popular shoes from Brooks because of its flexibility and performance on the road. I know that Brooks developed this shoe to make every running experience more natural and more responsive as possible. Given the positive feedback received by the PureFlow 7 myself. Compared to its predecessor, the Brooks PureFlow 7 has a simpler, cleaner look. The first time I wore it, I noticed that the shoe is so easy to put on and take off. The shoe provided a soft in-shoe feel with a breathable upper coverage. Right out of the box, the shoe is really impressive. The midsole and the outsole design are the same with the Pureflow 6, so I expected responsiveness and maximum flexibility from this running shoe. In the upper of the shoe is the stretch-woven material that offers good ventilation to keep the feet cool and dry. It is not as breathable as compared to a mesh material, but I had no problems with the breathability at all. The shoe was very comfortable to wear just like the other running shoes I own. The internal bootie design gave maximum comfort while giving my foot a good wrap. The internal fabric felt smooth to the skin, and I did not experience any irritation at all. The fit of the Brooks PureFlow 7 is incredible. Every time I put it on, I felt no restrictions on my feet. The shoe hugged my foot snugly. The roomy toe box allowed my toes to freely move inside, and the medium width is just perfect. The sizing is true-to-size, no need to go a half-size up. The PureFlow model promises uncompromising flexibility and close-to-the-ground feel. Gladly, Brooks was able to keep this promise by maintaining the same midsole and outsole technologies. The full-length BioMoGo DNA midsole foam offers a springy and energized ride. The foam is not too soft and not too firm for my preferences. It offered the right amount of underfoot protection and responsiveness. The midsole and the outsole unit of the shoe were engineered to deliver maximum flexibility. Thanks to the Forefoot Dynamic Flex Grid that offers extensive flexibility in the forefoot area. The traction of this road running shoe is fairly good, even on wet, slightly slippery surfaces. Overall, the ride quality of the Brooks PureFlow 7 is flawless. It gave me the responsiveness and flexibility that I need especially on long-distance run and daily training. The Brooks PureFlow 7 is a well-made running shoe with a very durable design. I have been using the shoe for numerous times already and remarkably, I did not see any significant damages in both the upper construction and the outsole. For an affordable price, I really think that this shoe is a good buy. All in all, I can sum up my experience with Brooks PureFlow 7 with two words – Amazingly Awesome! I highly recommend this shoe. Yes, I was annoyed by the holes in the outsole, but it is just a minor issue, and I can live with that. Brooks is a well established running brand that I haven't tried, so I bought a pair of Brooks Pureflow 6 on sale. Having transitioned to a more neutral, low-drop shoe, Brooks pure lineup seemed like a good fit. However, at 55 miles in the Pureflow 6, the glued seam on the tongue of the right shoe closest to the ankle came apart. I contacted Brooks, and one week and 3 emails later, they shipped me the Pureflow 7 as a replacement, free of charge, and let me keep the Pureflow 6 which I am about to retire after 400 miles running in them! Huge props to Brooks for having great customer service and being easy to work with! Brooks Pureflow 7 at 267 running miles. Most of my miles are on the road, though I do take these shoes into a nearby park occasionally, and they do fine on crushed limestone and gravel. 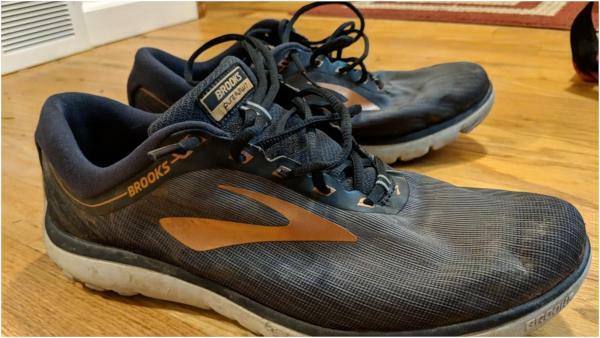 I cycle between these shoes, Pureflow 6, and Altra Escalante throughout the week and have put 267 running miles as of the writing of this review (January 2019). I also use these shoes occasionally for walking and errands. First, these shoes look pretty good. Good enough that my wife is okay with me wearing them when we’re out and about. She doesn’t feel that way about my Altra’s or Hoka's, and I can’t really blame her for feeling that way. The upper material is not as breathable as I’d prefer, but it’s durable, which is an acceptable trade-off to me. The laces are tubular, and a little long, which I’m personally not a fan of, but they work well enough. The heel cup is also a little stiff, but it is well formed to the foot, durable, and covered in soft material, which combines to make a surprisingly good heel cup. On the other hand, I find the design a little too long and narrow. I wish it could be a little more breathable. Also, the honeycomb-like sole pattern attracts rocks. Every run, these shoes will pick up at least one pencil-eraser sized rock, and you’ll need a screwdriver to get it out because of how deeply it’s embedded. Large holes in the midsole that constantly trap rocks. I’m impressed with the overall comfort and feel of these shoes. I thought that the narrowness would bother me, but it hasn’t been much of an issue. My feet are average in width though, so if you have wider feet, you might want to look elsewhere. These shoes feel like a soft cocoon of material that gently secures the sole to the foot instead of the other way around. After about 20 miles in the shoe, you really notice how well it forms to the foot. That said, the toe box does feel a little confining when I get past about 12 miles on a run (especially compared to my Escalantes), so I typically don’t take these shoes on my long runs. I’m especially impressed with how well they feel when running downhill. Ever bottom out the suspension in a car or bike? That’s sometimes how shoes with moderate to minimal cushioning feel when running downhill quickly, but the Pureflow 7 feels soft, responsive, and stable when I’m really pounding the pavement on a steep downhill. Durability is slightly better than expected for these shoes. The seamless upper has no holes or significant wear marks after 267 miles. The plastic toe cap beneath the upper does a good job of protecting the material from developing the typical “big toe hole” that other shoes might get. The soles are in good condition too and seem to have at least another 150 miles on them, and they still feel good on my feet while running. These are a good shoe that I will happily lace up for a run. They feel good, and I’ve gotten the miles I wanted out of them. However, I probably would not buy a second pair. There are other shoes I like more and the soles trap rocks, which is a constant (yet ultimately mild) annoyance. I plan to purchase a different Brooks shoe in the future, as the company has fantastic customer service based on my one interaction with them, and I like to support companies that treat their customers well. Would I recommend to a friend? If they did not have wide feet could find them on sale, yes. The Pureflow is for a neutral runner looking for the fast-paced lightweight shoe to get through their quick runs. The Brooks Pureflow 7 is a running shoe that’s designed for the roads. The design is optimized for those who have neutral pronation. It doesn’t have a lot of overlays, unlike its predecessor, the Pureflow 6. Such a look presents a clean and consistent structure for the façade. The upper unit makes use of a stretchy material offers a secure wraparound fit that is also ventilated. A Tuned Density Midsole is a platform configuration that follows the gender, the weight, and foot-shape of the runner. It is advantageous for those who want to have a pleasant underfoot experience throughout the running session. An environment-friendly foam adapts to the contours of the foot-pad, thus giving a customized in-shoe feel. The external layer of the Brooks Pureflow 7’s sole unit features blown rubber. It’s a traction-ready compound that has a responsive configuration to heighten the underfoot cushioning potentially. Flex grooves and cross-like holes allow the wearer to achieve a fluid heel-to-toe transition. The Brooks Pureflow 7 has a standard running shoe length. It accommodates the general preferences of consumers when it comes to size. The women’s version has a width-profile of B – Medium while the men’s iteration has the D – Medium option. This product has an anatomical last, which means that the platform has a foot-shaped curve that accommodates the natural curvature of the human foot. The outsole unit makes use of blown rubber which can be also found in the popular road running shoe, Brooks Glycerin 16. This material is responsible for doling out traction over the surfaces. Also, it has a soft nature to add a bit of cushioning that complements the midsole foam. Horizontal, vertical and slanting flex grooves allow the foot to bend naturally throughout the activity. It also makes the platform more fluid in its motion and capacity to propel the runner forward. The Dynamic Flex Grid features cross-shaped holes that reduce the weight of the sole unit and skyrockets the flexing capability of this running shoe. BioMoGo DNA is a full-length foam that’s made using recycled materials. The purpose of this compound is to cushion the foot and attenuate impact shock. Moreover, it conforms to the shape of the foot-pad, making sure to include the curves and crevices that don’t usually get any support. The Tuned Density Midsole is a design that’s tweaked to accommodate the gender, foot-shape, and weight of the runner, thus refining the in-shoe experience. A rounded heel design allows the platform to mimic the actual heel of the human foot and smoothly land on the ground. It benefits both heel and midfoot strikers. The upper unit of the Brooks Pureflow 7 utilizes a stretch-woven material to deliver a snug yet accommodating fit. And though it seemingly has a closed construction, it still permits air to go through, and circulate in, the foot-chamber. The collar and tongue unit are padded. These sections of the shoe offer a lockdown fit. They also prevent premature shoe removals. Synthetic overlays are printed onto the façade. They’re mostly to reinforce the eyelets of the lacing system and the sides. But they also help in providing a secure fit.